So it was finally time to hit the surfing beaches. 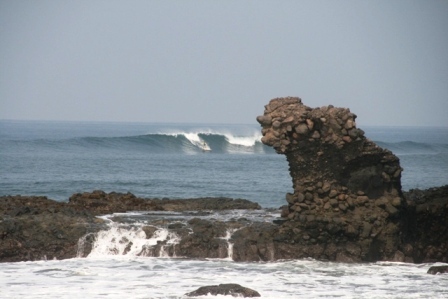 We had read that the Pacific Coast of El Salvador had unrivalled waves in Central America, warm water and uncrowded breaks. So we went to see for ourselves. Our destination was El Tunco, or “the Pig”, a small beach resort 5 km out from the not-so-great port town of La Libertad. La Libertad is an hour´s drive from the capital. The whole coastline is very popular for weekend city breaks, and it is starting to have international appeal. We stayed at Hotel Mopelia, a new venture set up by Belgian Gilles and his Salvadoran wife Patty. They have a lovely set up, a chilled out bar/restaurant, some cabanas, a pool, and direct access to the surf. Gilles told us that tourism has only been alive and well for 2 years in the country as a whole. Before that, if a local met a traveller, they scratched their heads and asked what are you doing here, you should go to Costa Rica or Guatemala where it is much better! 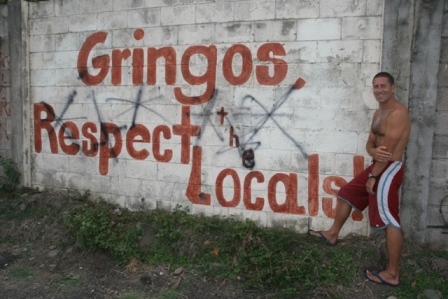 The government tourist board was set up just 2 years ago, and their first campaign was aimed at their fellow countrymen, asking them to play their part in developing tourism and bringing in the gringo dollars. One of the first ad campaigns showed before and after: a dirty beach with a few shacks and some locals, transformed into a clean beach with lovely buildings and gringos (white people) sunning themselves on deckchairs! of young fit guys who were afraid of nothing. 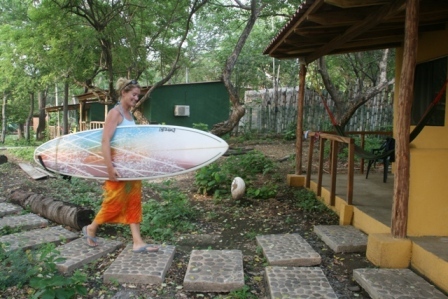 It took a trip the next day to La Libertad, to a more mellow surf break, to get me going properly. 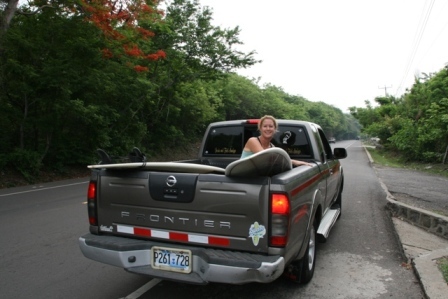 With the help of William, a local surf instructor, I got upright more than I wiped out! 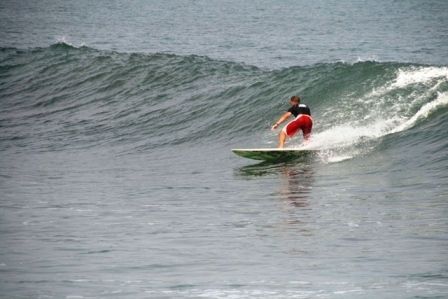 Cathal (aka Carlos) nailed some great waves at La Paz break in La Libertad, and was even more pleased that I was on land with the camera! 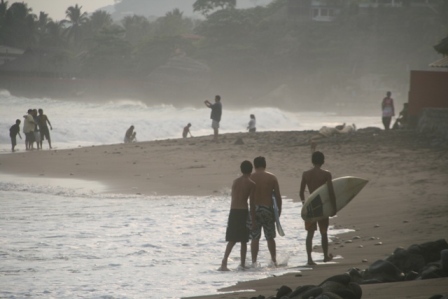 El Tunco itself is in the infant stages of tourism development, which has pros and cons. The pros is that is is peaceful during the week, and there are just a handful of operators running small 10-12 room hotels. The weekends get a little busier with Salvadorans, but it is still all rather small scale. It needs to develop just a little bit more, so that you can enjoy a decent americano after a morning session on the water, and have things to do other than surf or ..look at the surf. There is an opening for a yoga instructor and a masseuse, definitely!